Buckley Industrial supplies a wide range of fire & marine hoses & couplings: from Layflat fire hose to Marine Hose, and Instantaneous & Storz couplings as well as Suction hose couplings. 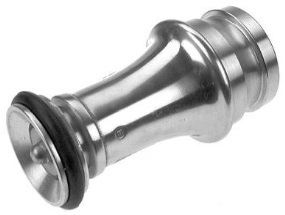 These are used to connect hose together and also to other fittings. Thanks to the sealing mechanism, instantaneous couplings are suitable only for use in pressurised systems and are optimised for flow between the male and female half. Light Alloy for freshwater and Gunmetal for seawater. Couplings comply with BS336 – 1989. If you need to convert one size to another in the same connection system or from one to another, instantaneous adaptors are what you require to accomplish this. Used at the delivery line of hose to assist water velocity, resulting in spray or a jet, branch pipes and nozzles are vital tools for firefighting. These are the necessary couplings to connect suction hoses. However, they work differently to an instantaneous coupling in that it provides an effective seal for using in suction applications. The coupling halves are normally threaded with a special round thread to BS336 and screwed together to compress a sealing washer. Water flow direction is typically from the female half to the male half of a coupling and it is possible to screw the coupling halves together without needing to twist the hose. The female halves come to 4 lugs and males to 2 lugs. These are essentials to enable underground fire hydrants to connect to a pressurised water mains supply. 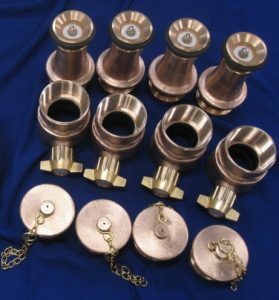 Bases of standpipes usually come to 2.5″ in threaded female hydrants round thread with the outlet usually being also 2.5″ as female instantaneous. 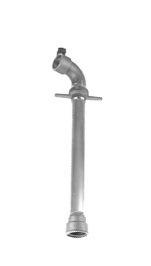 Also, the standpipe shaft length comes in at 30″ and may benefit from the use of hydrant keys and bars. 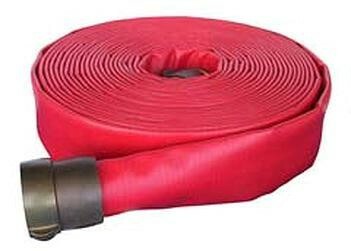 We currently supply Layflat Hoses for Firefighting, Water Utilities, and many more. Layflat hoses for compressed air applications within the construction and demolition industry sectors. We offer unbeatable quality and outstanding customer service. Lightweight layflat Compressed Air Hose for Industry. Lining & Cover: High quality NITRILE-synthetic rubber covers the jacket completely very smooth inner surface for low friction loss external cover with ribs for high abrasion resistance. 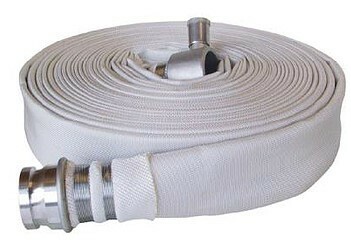 Layflat Fire Hose are used by firefighters worldwide and are probably the most important piece of equipment on a fire appliance. Type 1 hoses are those to which no external treatment has been applied so are liable to absorb liquids. Type 2 hoses are those to which an external elastomeric coating has been applied to give some protection against the absorption of liquids and to improve resistance to abrasion. High Performance, High Pressure all synthetic PU Coated delivery hose to BS 6391-1983 Type 2. UK DOT-MSA (Marine Safety Approved) for Marine use. Suitable for Municipal and Industrial Fire Brigades, Oil & Petrochemical Refineries, Marine & Industrial Applications. The Marine Hose is a white uncoated hose suitable for high pressure Marine applications. 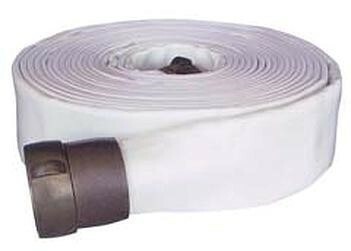 General purpose all synthetic layflat delivery hose to BS6391 Types 1 and 2. UK DOT-MSA (Marine Safety Approved) for Marine use. Suitable for industrial and rural Fire Brigades as well as static building protection, marine use and for general industrial, commercial and civil engineering applications and all washdown applications. Other sizes can be manufactured to order subject to minimum order requirement. Inner Lining Two-component system consisting of black SBR synthetic rubber and white NBR-synthetic adhesive. Resistant to ozone and to external contact with oil products. The lining guarantees a smooth surface and low friction loss. External Coating: Polyurethane coated, standard colour red or yellow. Polyurethane coating increases the abrasion resistance and reduces water absorption. It requires minimum maintenance and is easy to clean. 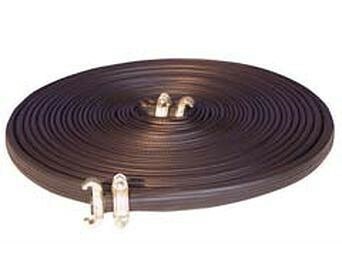 Coated delivery hose to BS 6391-1983 Type 2. The High quality smooth PU coating of the Highlander offer abrasion, oil and chemical resistance with minimal maintenance. Non standard colours can be manufactured to customers specification. 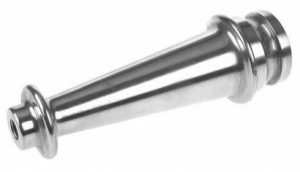 The Standard lightweight water delivery fire is supplied in bore sizes 19mm up to 152mm and ranges between 60 bar and 30 bar. 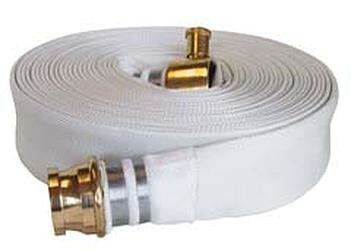 Essentials for firefighting, layflat fire hoses are used for general purpose water transfer and thanks to the range of sizes they’re available in, are used throughout modern Fire and Rescue services.